Living in a dorm room often feels like the ultimate coming-of-age test. This is most likely the first time you’ve lived on your own, and you’re expected to cohabitate with a complete stranger. To say it takes some getting used to is definitely an understatement! 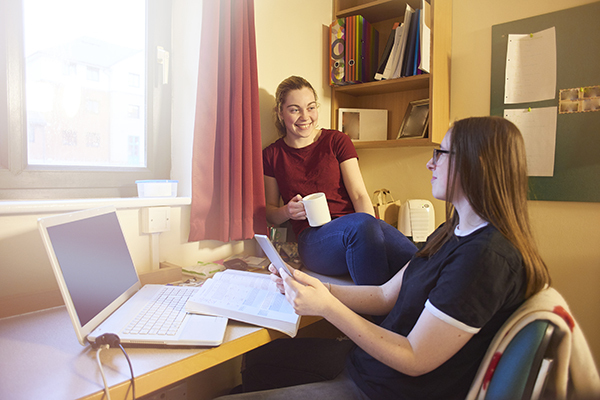 Below are some hacks for streamlining the process a bit and making your dorm the best it can be, whether that means getting the most out of your space or finding tricks for saving time. When it comes to living in a dorm, reusing and recycling everyday objects isn’t just good for saving the environment or even money—it’s perfect for saving space. Really, reusing and recycling is a hack for living in general, so start perfecting those skills now! Cardboard boxes from school books are perfect for storing all sorts of things you might not need to use on a daily basis and really come in handy when it’s time to return rented books. Usually, rental companies like Chegg ask customers to return rental material in the same box it was shipped in, so reusing theses boxes is also a great way to keep track of them until the end of the semester. Little candy tins (like Altoids) are perfect for holding onto small trinkets that easily go missing, like earrings, bobby pins, hair ties, and even paperclips. You can also make your own mini first aid kit by filling the tin up with Band-Aids, travel Neosporin, and alcoholic wipes. Plastic bags are super easy to reuse and recycle when living in a dorm. Use them to line the inside of trash cans, to collect soda cans and bottles, to bring your lunch or snack to class, and keep the rest of your stuff dry when bringing a water bottle or coffee mug to class. It’s also a good hack to keep a plastic bag in your backpack or sports bag to stick stinky or wet clothes in. If you already have enough plastic bags or if your local stores charge for plastic, invest in a sturdy reusable bag. One good bag is perfect for a trip to the grocery store and saves you from lugging an armful of bags around on the bus or making several trips back and forth from the car. When it comes to saving space in your closet, the metal tabs on a soda can are a simple and effective solution. Plus: you’re recycling! Slip the hook of a hanger through both of the holes in the soda can tab to maximize space. This hack allows you to hang three or four items vertically instead of horizontally, essentially taking up just one spot in your closet. Binder clips have lots of different uses and are easy to get a hold of. You can use them in the fridge to keep bottles organized, to hang electronic cords in easy-to-access places, or make them part of a DIY tea bag when you’re in a pinch! Want to avoid the crazy shared dorm kitchen? Get an electric kettle for coffee and tea you can make in your dorm (assuming it’s allowed—make sure you check). It feels like a luxury and offers more uses than you might think. Not only is a kettle perfect for making a quick—and cheap!—cup of coffee or tea, but you can also use it for hot chocolate, soup, ramen, and a mini steam bath when you’re sick. Coffee makers are also pretty versatile and have been used to make pasta, the perfect cup of ramen, and even boiled hotdogs! When you’re pressed for time with an empty stomach, food hacks for dorm room cooking feel like sparks of genius. Toasters can be used for more than toast, people! (Although avocado toast is an easy and yummy dorm snack.) You can also make simple things, like toasted sandwiches, and warm up frozen patties. Again, school rules might restrict the use of toasters in a small dorm room, but you can usually find one in the shared kitchen. Don’t forget the trashcan. Even with a hack kitchen/kitchenette, trash builds up a lot quicker than you might think. A trashcan with a cover is essential for living in a dorm, especially when you have one or more roommates. If you don’t have a trashcan with a built-in cover, use a cardboard box. It might take some tweaking, but make sure it folds easily over the sides of the trashcan and you can lift up a flap in the middle to insert trash through. Depending on the size and layout of your dorm room, lofting your bed can add a lot of floor space. You can store out-of-season clothes, luggage, boxes, and just about anything else you can think of under there. You might even be able to fit a couch or desk below as well to create your own little cave that’s perfect for homework or movie night! Over the door shoe organizers are obviously important for saving space and keeping things straight in your dorm room. The cool thing is they can be used for lots of other things besides shoes. You can keep snacks, clothes, makeup, hairdryers and flatirons, and school supplies tucked into each pocket. This will free up a lot of space around the room and under the bed. Even with your best efforts, a dorm room can get stinky. Here are a few hacks for freshening things up: put a few dryer sheets or a car vent clip over the heater/air vents in your room. The car vent clips works best since it stays in place and is designed to dispense its fragrance when it comes in contact with heat. In the warmer months, lay the dryer sheets on the opposite side of a fan so they stick. You can also leave dryer sheets in places that are prone to smell, like laundry bags and boxes of out-of-season clothes. The first few weeks of classes are always a bit stressful, especially when you can’t remember a building or classroom number. A great hack is to set the lock screen of your phone as your schedule, complete with time, location, and professor, and you’ll have a much easier time transitioning into the new semester. Get a bathrobe with pockets. When your hands are full with a loaded-up shower caddy, clothes, a towel, and flimsy shower shoes, it’s easy to forget your keys. Having a bathrobe with pockets makes it a lot easier to carry keys (and remember them). You’ll be thankful you’re not the person locked out of their room in just a towel. Hotel shampoo and conditioner bottles are the perfect size for a trip to the campus gym or an impromptu weekend adventure with your friends. Just refill them as needed. A travel container for bar soap is also very helpful and can help prolong the life of your soap. Bonus hack: when your bar soap is down to just a tiny sliver, press it down to the back of a new one until they fuse together so you don’t waste any soap! As the next four years progress, you’ll find your own hacks for dorm living. You can count this as adulting early!